Neil Powell’s biography of Benjamin Britten, reviewed. While clicking through Britten 100, the website dedicated to the centenary of British composer Benjamin Britten, you might begin to suspect that the composer is not exactly in danger of being forgotten this year. As of this writing, the site lists more than 2,000 performances or events related to Britten’s music on its worldwide calendar. And so it’s hard to think of a recent composer less in need of classical music’s usual big reclamation projects of top geniuses at every century-birthday. And Britten is also thriving in the concert hall. While Britten himself was nervous about his reputation among musical elites in the experimentally extreme midcentury, his own blend of tonal writing outfitted with original, harmony-stretching orchestral effects can make the composer’s works feel both classic and forward-looking, even today. 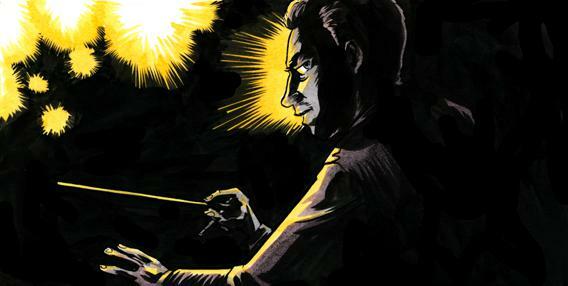 Britten’s operas do well in his home country, and he’s one of the few 20th-century composers to have made any inroads at all in conservative American opera circles. The endurance of Britten’s popularity into the new century was helped along by the entire chapter Alex Ross devoted to him in his influential, popular The Rest Is Noise—a book whose chapter headings otherwise tend to belong to whole decades (or continents) of musical activity. Is it necessarily prurient to say so? Powell seems to suggest as much in his preface, and the rest of his biography does its best to enforce this perspective throughout. While citing the fact that Bridcut’s documentary turned up no explicit sexual activity with the youngsters who reliably turned up in the composer’s retinue, Powell seems eager to close the case there, even if several of Britten’s erstwhile “children” copped to an awareness of Britten’s attractions at the time (as well as some boundary-skating bed-sharing and head-kissing). This account may not be prurient, but it does seem like the work of a defense lawyer, not a biographer. Benjamin Britten didn’t make a sexual advance to a boy because Benjamin Britten wasn’t the type to make sexual advances to boys, don’t you know. When grappling with such material, it’s tempting to say: Artists need not be saints. Certainly we don’t require perfect records of behavior to appreciate the works of countless creative geniuses. Yet in the case of Britten’s personal life, the more distressing avenues are of great potential use to our understanding of his art. His greatest operas are straightforwardly concerned with youthful loss of innocence. And, in the case of Peter Grimes, the loss of innocence entails abuse of several young apprentices at the hands of the outsider title character. This is indisputable, even if other aspects of the opera may appeal to our sympathies. The town’s conduct in hectoring and condemning Grimes, for example, may not always be morally above reproach. Likewise, the tale of the loner condemned for his native state of being suggests a relationship to Britten’s wartime pacifism (put forward by Britten’s camp as the official metaphor carried by Grimes, during his lifetime). And the work also hints at the social stresses pursuant to a love that dared not speak its name in the era when Scotland Yard was actually spending time investigating homosexuals (including, for a time, Britten himself). But the boys’ bruises and corpses are not to be dismissed, either—nor does Britten’s complex, sometimes sympathetic and sometimes harrowing music ever suggest that Grimes be viewed simply. Yet Powell, in this book, treats Grimes to the least substantial analysis of all of Britten’s major operas. He has keen insights into the dramatic structures and implications of Death in Venice, A Midsummer Night’s Dream, and Billy Budd, for example, but his 13-page description of Grimes is mostly padded with creative-process backstory, plot summary, and a tallying of initial critical opinion, for and against. He keenly notes the disingenuous public move taken by Britten and Pears, about the opera’s supposed reflection of their pacifism. But in considering the two as a likeminded duo, he neglects to engage with the fact that one of the men was not just attracted to other men, but also to boys. On this view, it’s natural that Powell would assign Grimes lesser status among the great Britten works due to supposed faults like the “irresolution” of its “disconcertingly muted conclusion.” To others, it may feel as though Powell’s drive for pursuing the most noble possible account of Britten’s life has led him to under-read what many consider Britten’s greatest, most complex work. It’s worth noting that much later on in Powell’s book there is some valuable reporting that runs against his earlier, über-prim read of Britten’s infatuations. Late in the book, Powell makes a reference to Britten’s “troubled humanity” that sounds as if it contradicts his claim of lifelong “exemplary” behavior. And while Powell also provides a lovely account of Britten’s mature lifelong partnership with Pears, his first (and still most important) interpreter, the author is also brave enough to venture that the tenor may not have fully understood the composer in some key ways. Indeed, Powell all but suggests that the consummation of their relationship was, for Britten, entered into as a reactive escape from yet another ill-advised entanglement with a late-adolescent boy. To note that Powell’s book seems to be in tension with itself is not to deny its other virtues. As you might expect from a biography of Britten written by a poet, the book offers some interpretive wonders when it comes to the composer’s many settings of poetry. Powell’s very strong on Britten’s Thomas Hardy settings, known as “Winter Words” –particularly in the way that he analogizes a relationship between Wordsworth and Hardy, and the composer Gerald Finzi and Britten. And though Powell humbly poor-mouths his own skills as a musician (and score reader), his account of Britten’s less-celebrated chamber works enlarged my own appreciation of Britten’s musical language. To acknowledge the complexities of Britten is not to beg for the banning or suppression of his works. (I say: See every staging of a Britten opera you can.) But the relationship between his private life and some of his most famous creations is suited to provide fodder for much useful contemporary thought, and it’s a shame a critic as astute as Powell isn’t willing to dive in. Benjamin Britten: A Life For Music by Neil Powell. Henry Holt.